As you know if you read my previous entry, this weekend was the fall 2010 meeting of the World Bank and International Monetary Fund, held in Washington DC. I have demonstrated against the World Bank and IMF on seven different occasions prior to this weekend, most recently prior to this in the spring of 2009. This weekend’s demonstrations were perhaps the worst anti-IMF demonstrations that I have ever attended. They were disorganized, and no one was willing to step up to the plate and even so much as try to keep the group on message. First of all, there was Friday’s demonstration. As it turned out, the 10:30 meeting point at 16th and Harvard Streets was basically a pickup spot for an ongoing demonstration. 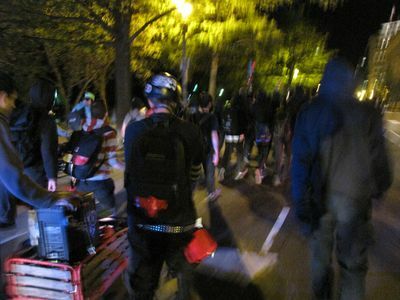 I showed up in plenty of time, and when the bloc swooped through, I, along with about four others plus Luke, joined it. That should have been a red flag right there – the group was in and out in less than two minutes, rather than staying at the announced meeting point for any appreciable length of time in case people were late or anything. 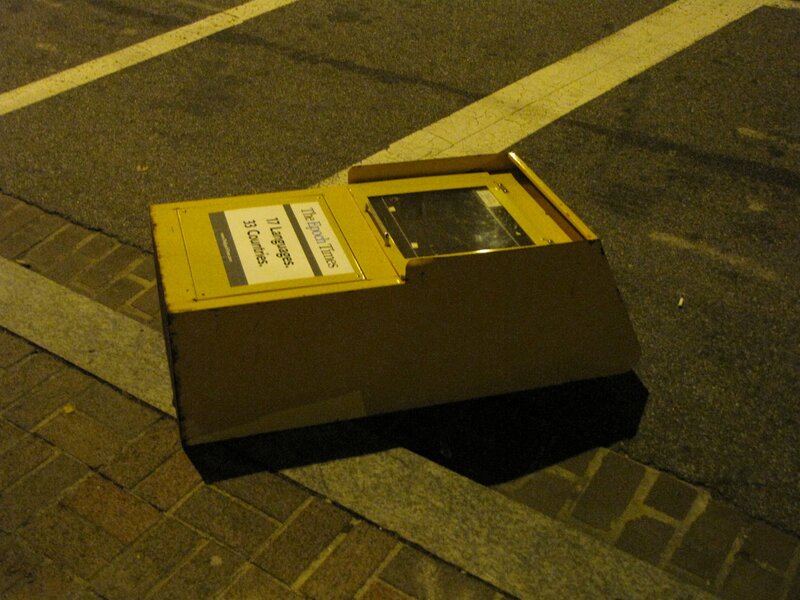 As it turned out, this bloc had already lost sight of its message. There was no anti-IMF message going on here, but rather they were trying desperately to keep a step ahead of the police. The bloc was going up and down neighborhood streets, moving water-filled plastic Jersey barriers to slow down the police. 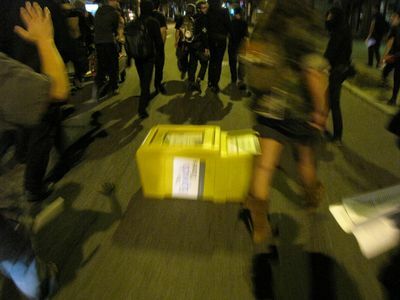 Additionally, they were dragging newspaper boxes out into the street, again to slow down police. And if all you’re doing is trying to stay ahead of the police, you have lost your way. Here’s a tip: For the most part, Washington DC slopes downward the further south you go. Thus to reach downtown, where the World Bank and the IMF and the delegates’ hotels are, you want to go downhill. They did make a couple of hotel stops, however. They made a stop at the Mayflower Hotel and the Concordia Hotel, the latter catering exclusively to the World Bank and IMF and related organizations. At both hotels, the bloc stayed for maybe a minute before moving on. 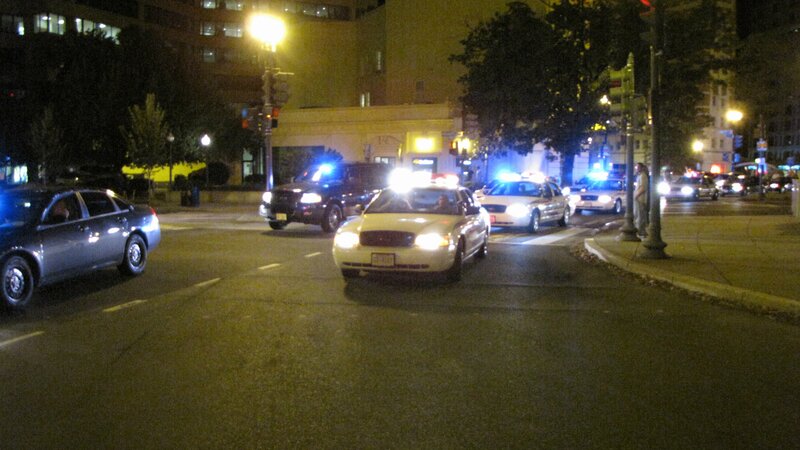 Of course, the police were a little less organized than usual this time around as well. The MPDC Special Operations Division, which provides the police presence at protests, was without Commander James Crane and Captain Jeff Herold, both of whom are no longer in Special Operations (Herold transferred to Second District, but I couldn’t find out where Crane went). People were trying to identify who the “new Herold” was, but I think it might take a bit to find out who that person is. The police made a few moves that I found a little strange, and it certainly didn’t feel like the same group of cops that we were more accustomed to dealing with. And then the chants had nothing to do with the World Bank and the IMF. A lot of “Whose streets? Our streets!” going on, and a lot of “F— the police!” as well. Meanwhile, I think I had bitten off more than I could chew for Friday. I worked a full day at the office at the regular time, and then stayed until 9:30 before catching the bus to go to the protest. I managed to march with these people for 90 minutes before the pain from blisters that I had raised on both feet over the course of the march, general fatigue from too long of a day, and my frustration with the march’s message and lack of organization became too much. 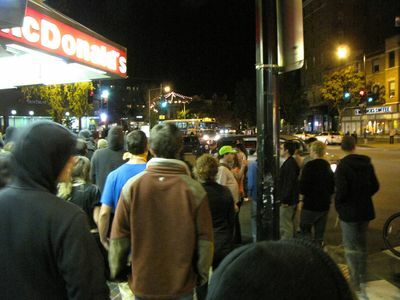 After visiting the Mayflower and the Concordia, as the march passed near Dupont Circle again, I ducked out right around midnight. The people leading (or not leading) the march may not have known where they were going, but I did. I picked up the car at the office and then went home in order to tend to my brand new blisters. As it turned out, I didn’t miss much. The march eventually made its way down to the World Bank, and then broke for the night. Unfortunately, I couldn’t see anything that the march accomplished aside from a bunch of overturned newspaper boxes and displaced Jersey barriers in the march’s wake. But this Friday march was just an appetizer, I suppose. On Saturday, there was a family-friendly event at Freedom Plaza during the day, and then a concert in the evening. I arrived around 6:30, where I found the group sitting in a circle, having a group discussion about how to run the night’s mobile street party. By “mobile street party”, I felt optimistic that this would basically be “Funk the IMF”, and have a light and festive atmosphere, especially after the aggressive tone of the previous night’s march. We would see, I suppose. The group discussion ended with no concrete plan, but rather just a few nebulous ideas about potential targets – another red flag to me. And then the concert started. While I didn’t care for the music (I’ve never been into heavy metal), it was a great time to get to know the other activists who also were less into the music, discuss what we’ve been doing, and discuss the previous day’s march. I had wonderful conversations with Luke, a lady named Emily, my pal Missy, and one of the legal observers. We also all quickly learned that the people lined up for the concert had a complete disregard for the schedule. Sure, the whole thing was running late, with the concert starting a lot later than it was supposed to. But it went on until 10:15, when three Park Police officers showed up, and without their having to say a word, the march soon got going. So the concert ran longer even than the originally scheduled two hours, and mostly outside the scheduled two-hour window. Thanks. For most of the concert, a bunch of us were like, okay, when are we going to march? It became quite frustrating not only because the plans for the march were nebulous at best, but also because the bands went on for more than two hours after they were scheduled to cut it off. Thanks. And I was already having trouble keeping up, as my legs were still a bit sore from the previous night, plus the blisters on my feet from same were starting to act up again. I think I lasted about 30 minutes on this march, before I got completely fed up with the lack of organization and lack of any real message and left. When we got close to Farragut North station, I said goodbye to a few folks, and I bailed. I make no apologies for this – I came out to demonstrate against the World Bank and the IMF, and these people had lost sight of the forest for the trees, as this crowd was once again more interested in slowing down the police than anything related to the World Bank and the IMF. And there were no people to get our message out to. Downtown around the White House and Freedom Plaza is a ghost town at that hour. No one lives there, there are no tourists passing through, and there is no nightlife scene in that area. 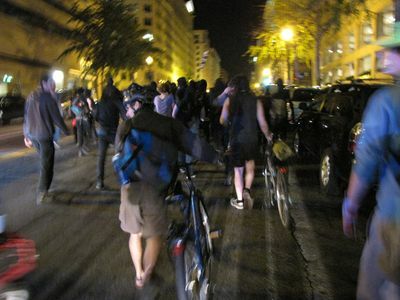 Marching around an empty part of town on foot while trying to evade cops on motorcycles is not my idea of an effective demonstration. And based on what Luke posted on Indymedia, bailing was the right thing to do, as the group was later corraled somewhere on L Street, and one person ended up going to the hospital with a bleeding head wound. Amount accomplished: zero. I hope the person who got the head wound is all right. From what I can tell, the radical community made a number of fundamental mistakes that led to the disaster that was this weekend. First of all, the planning for this was light at best, and it showed. Secondly, the emphasis was more strongly placed on evading the police than on the actual message. 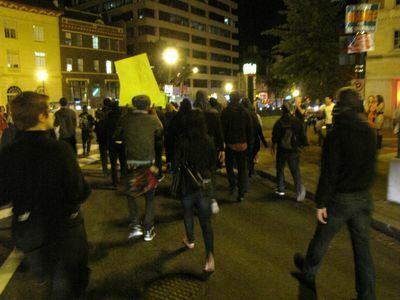 And lastly, none of the DC-based activists stepped up to so much as say, “Hey, I know where I’m going,” or if anyone did, they were summarily ignored. But the biggest thing is that the police are not your enemy. If they become the main target of your demonstration (unless that’s the idea from the get-go), you’re cooked. The police are like that annoying little kid that’s always tagging along. They’re going to be joining you, whether you like it or not, but that doesn’t mean you have to pay them any attention. Likewise, by putting so much effort into evading them and slowing them down, you have handed them the trump card. You have demonstrated by your actions that you fear them, and one of the things that the police deal in is fear. If they know that you’re afraid of them, they’ve got you. After all, who’s in charge here? The anarchists like to think that they run the show, so let’s do it already, and show that we really do – and smartly, too. Put the police to good use. Make them stop traffic and clear the way for you so that you can safely take your message to the streets. Our taxes pay for them, after all, so we might as well get some good use out of them for our own social-justice purposes. But you can’t tell them that they’re working for you and not the monied interests that we’re demonstrating against. That has to be our little secret. But the moment you yield the upper hand to the police, and through your actions, show that you fear them (and I’ve seen it too many times), you’re dead meat. 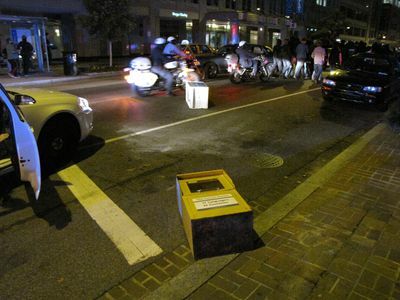 That’s the sign of a bunch of masked hoodlums, many from out of town, having a night of mischief in the streets of Washington DC, showing that they’re afraid of the cops, and leaving a trail of destruction in their wake. Some of us, you realize, still have to live here, and we take more pride in our town than that. And it really irritated me that no one stood up to say, hey, don’t trash our town. When I brought up the issue with another local activist, saying the exact phrase, “Some of us still have to live here,” I got the line about autonomous actions and what can you do. Thanks for nothing. It’s not that you have to stand in front of people wielding a bat to get people to not leave a path of destruction in their wake. You have to talk to them, and convince them of the idea, and make them realize for themselves that it is a bad idea to leave overturned newspaper boxes and the like in their wake. Additionally, I noticed on Friday that many of the police-evading actions that certain people engaged in most inconvenienced non-participants. For example, the Jersey barriers that got moved trapped a civilian vehicle on a one-way street. This is not a good thing. After all, the point is to make these people sympathetic to your cause (so that they might join the cause later), and you’re not going to get that if you directly inconvenience them and alienate them. And this is not to say that black blocs are bad or otherwise counterproductive to a good social movement. They have their place. But the black blocs that are most effective are the ones that are strong on message and mobilize the people for their cause. J27 from three years ago had a really good black bloc. 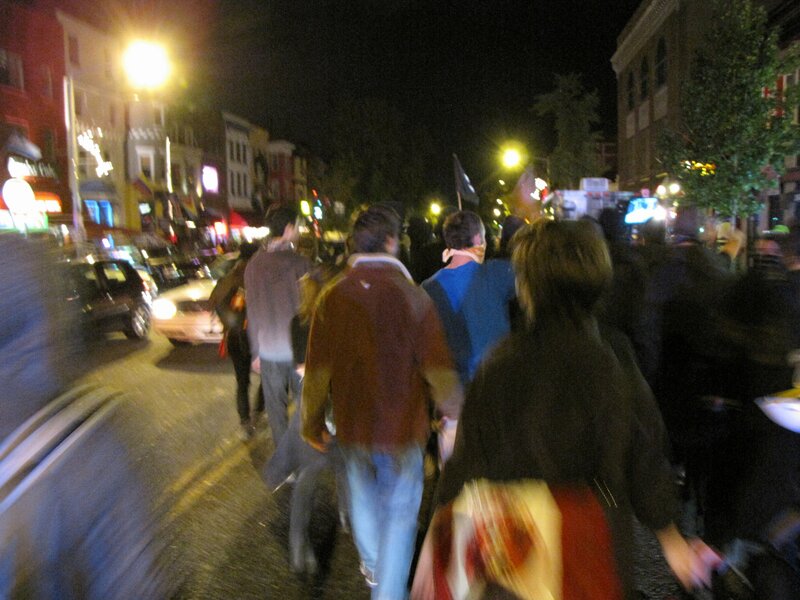 That bloc massed in Dupont Circle, away from the main demonstration. Then, cops be damned, it made a beeline for the main demonstration, crossed through the middle of the crowd, marched around to the front of the crowd, and then delivered the crowd to the steps of Congress to demand an end to the war (which isn’t over until every last soldier is home despite what the media might tell you). That sent a very powerful message to the world. And there was no path of destruction in the bloc’s wake, save for some minor graffiti. That black bloc was in charge, and the cops, whether they wanted to or not, were taking orders from them, though I doubt anyone realized it at the time. 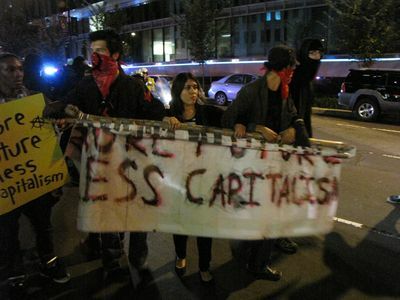 Now in 2010, the black bloc that convened for the World Bank and IMF protests failed completely. It left me more than a bit disillusioned. Nothing was accomplished except for petty vandalism. The message was lost to a cat-and-mouse game with the police. 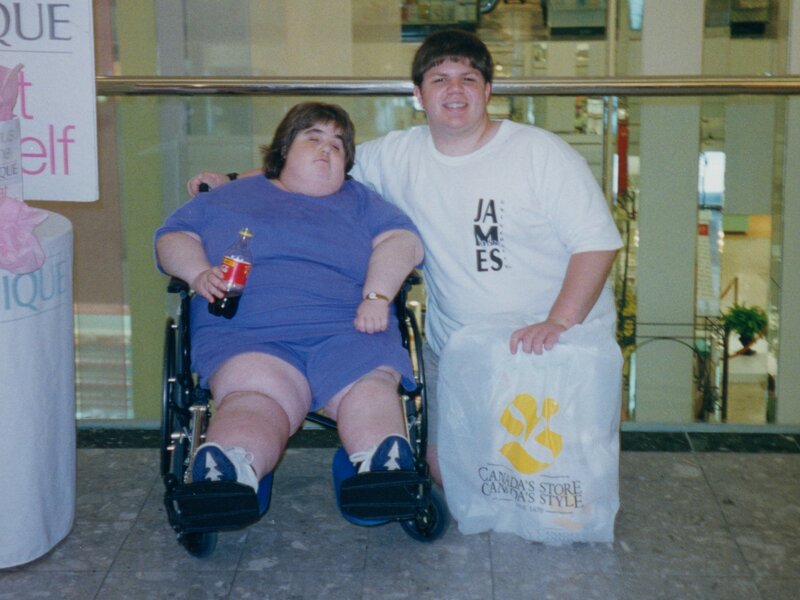 I’m sure that the IMF delegates are laughing at us about how we were unable to mobilize any organized resistance to their destructive policies. I can only hope that the movement learns from its complete and utter failure in the fall of 2010, but unfortunately, I’m not holding my breath. Web site: Remembering another successful bloc - "Midnight March". This was a case where we gave the cops an inch in one direction, and took a mile in the other direction, and came out on top. We didn't fear the cops, and in fact, a little cooperation went a very long way in that case. Quote: Honestly, I don't know what bothers me more - that the movement defeated itself through its own lack of organization, or the senseless path of destruction left in its disorganized wake.